Night Vision technology consists of three major types: image intensification (light amplification) and thermal imaging (infrared).Most consumer night vision products are light amplifying devices. Light amplification technology takes the small amount of light, such as moonlight or starlight, that is in the surrounding area, and converts the light energy (scientists call it photons), into electrical energy (electrons). These electrons pass through a thin disk that's about the size of a quarter and contains over 10 million channels. As the electrons travel through and strike the walls of the channels, thousands more electrons are released. These multiplied electrons then bounce off of a phosphor screen which converts the electrons back into photons and lets you see an impressive nighttime view even when it's really dark. Night Vision scopes are electro-optical devices that intensify (amplify) available light. The main component of such a device is the Image Intensifier - basically a vacuum tube. 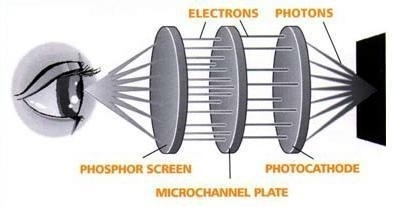 At the input end, the objective lens collects the particles of light (photons) arriving from the subject and focuses them on the image intensifier tube. 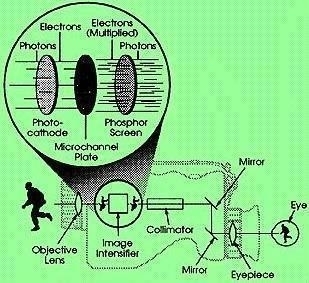 Inside the image intensifier tube a photocathode absorbs these photons and converts them into electrons which are amplified and projected on to a green phosphor screen at the rear. When this highly intensified electron image strikes the phosphor screen, it causes the screen to emit light that you can see. Since the phosphor screen emits this light in exactly the same pattern and degrees of intensity as the light that is collected by the objective lens, the bright night-time image you see in the eyepiece corresponds closely to the outside scene you are viewing. The phosphor screen is coloured green because the human eye can differentiate more shades of green than any other phosphor colour. The number of times the screen image is brighter than the one arriving at the photocathode is called the gain of the Intensifier.However, gain is a function of two factors, the ability of the photocathode to convert the weaker photons into electrons, and the amount of amplification which accelerates these electrons onto the screen. If the type of photocathode is fixed, more gain means more screen brightness, not the ability to see better in the dark. There are two ways to measure gain - tube gain and system gain.Tube gain is usually seen in values of tens of thousands and is more a laboratory figure that is not necessarily indicative of a devices performance. If tube gain is too high, the tube will be "noisier" and the signal-to-noise ratio may go down. System gain is based on the total system ie. tube, optics, power supply etc. System gain is usually seen in the low hundreds for Gen 1, mid-hundreds for Gen 1+, 1000-3000 for Gen 2/2+, Gen 3 (Omni I/II/III/IV) ,HyperGen (SHD-3/XD-4/XR-5 ) and Gen 4(Gen omni V/VI). System gain is the figure that potential night vision purchasers should compare. Beware of claims, especially for Gen 1 units, in the tens of thousands - this can only be tube gain and not system gain. Image Intensifiers exist in many different shapes and sizes and four main types. Gen 0 and Gen 1 systems use electrostatic inversion and electron acceleration to produce gain. Both are characterised by geometric distortion but where Gen 0 requires active infrared illumination, Gen 1 has higher photosensitivity and was the first truly passive image intensifier. Gen 1/Super Gen 1+ offers the optimum in performance/cost-effectiveness for the non-professional user. One of the unique characteristics is that it can potentially stay 'on' for some time after it is physically switched off due to it holding a residual charge. Gen 2 and Gen 3 systems do not suffer this 'afterglow' - the image disappears as soon as they are switched off. They are generally smaller in size and weight and use noticeably less current. They both use a microchannel plate (MCP) to improve gain and image resolution, but on Gen 3 the tube is also coated with an ion barrier film to increase tube life. However, they are very similar internally with the main difference being their photocathodes. Whereas Gen 1 and Gen 2 photocathodes may be the same (Tri-Alkali), Gen 3 technology is based on a completely different substance, Gallium Arsenide, that is up to three times more light sensitive. Beware of systems claiming to use US Gen 2+ image intensifier tubes. The US has manufactired only Gen 3 tubes for at least the last 5 years. The likely source for any US Gen 2+ tube is therefore military warehouse clearance stock. Whilst you may be lucky to get a tube that has been sitting as a spare, it is still many years old and probably not up to the specification of current production. Worst case scenario is that you get a well-used, lifetime limited tube with much reduced sensitivity due to usage and age. Although Gen 3 intensifiers are the most sensitive, they are not necessarily the best for all applications. They are more highly sensitive to the invisible, near infrared part of the spectrum. In many urban and suburban areas lit by street lights, there are insignificant amounts of near infrared. Gen 3 performance then appears to be no different to that of the earlier generations. In fact, Gen 3 systems tend to ‘white-out’ when exposed to high light levels losing a lot of image detail and contrast. They are really only seen at their best in the very darkest rural locations. Latest development is auto-gating HyperGen image intensifier tubes. These are designed to give optimum performance and minimal halo when scanning from very dark to light areas or vice versa. This makes them the most effective solution for urban operations and offers the best protection where there is likely to be bright light sources such as street light, car headlights etc. It is more true of night vision than almost any other product, you really do get what you pay for. There is a noticeable performance advantage as you work up the intensifier tube scale. However, as with many products, the percentage of performance gain reduces compared to the increased outlay in cost for the highest capability units. Typically uses an S-1 photocathode with peak response in the blue-green region (with a photosensitivity of 60 uA/lm) using electrostatic inversion and electron acceleration to achieve gain. Gen 0 tubes are characterised by the presence of geometric distortion and the necessity for active infrared illumination. Typically uses an S-10 or S-20 photocathode (with photosensitivity of 120-250 uA/lm), electrostatic inversion, and electron acceleration to achieve gain. Because of higher photosensitivity, Gen I was the first truly passive image intensifier.Characteristics of Gen 1 include high voltage power supplies,geometric distortion toward the periphery, reasonable performance in low light and ‘blooming’. The tube can potentially hold a charge for some time even if no power is being supplied, the image just gradually fading. Tube gain varies between 100-900x - beware of claims for much higher values. Resolution in the centre varies between 25-35 lp/mm. Gen 1 tubes generally have a high power requirement which can mean that they emit a high pitched tone when driven hard - this is especially true of twin tube designs (binoculars or goggles). Due to the manufacturing process it is usual to find cosmetic blemishes(spots/patches) in the tube. These are considered normal and are not a defect. Not well suited to still photography due to limited light amplification (plus limitations of film speed/aperture/shutter speed combinations) and noticeable drop-off of image sharpness towards the periphery. Video filming is possible, thanks to the additional light gain of the video camera’s CCD, in those units offering the best quality/highest sensitivity tubes. Most budget-priced Gen 1 night vision tubes are manufactured in Russia - they account for approximately 95% of the world market. Typical MTTF: 1000 hrs. This is the next modification of the Gen. I NV tube with a fiber optics plate being installed at the front or at the back of a tube. This modification allows for an improvement of the image resolution and prevents distortion from other light sources in a field of view. Tubes of Gen. I+ have light amplification of approx. 1 000 times, while the photocathode sensitivity increases to min. 280 mA/lm. Resolution in the center is 45–50 lp/mm,typical MTTF 1000 hours. NV units built with the Gen I+ tubes differ from the Gen. I units by increased image quality, lower distortions and better viewing distance in passive or active mode (with an IR illuminator). These scopes work well in an urban environment. In the open space, the units are effective with the ambient light levels down to ¼ of a moon. When light conditions are lower, an IR illuminator is needed. The cost of the Gen. I+ tubes is in 4–9 times higher than the cost of the regular Gen. I. Note. The Buyer should take into consideration that some producers use the designation Gen. I+ for their devices Gen I. It often misleads buyers because in fact tubes Gen. I have a resolution not higher than 38–40 pl/mm. We use the designation Super Gen I+ in our English advertising to make clear for the buyers peculiarities of the tubes Gen I+ with high resolution. The construction of the Gen. II tubes differs from the Gen. I+ by using a special electron amplifier — the micro channel plate (MCP). he performance characteristics of such NV tubes are: a higher photo cathode sensitivity of 240-350 mA/lm, with the resolution of 28–38 lp/mm. The lifetime of these tubes is designed to be not less than 1 000–3 000 hours of operation (Typical MTTF 2000 hours ),typical SNR 11. Two types of NV tubes with micro channel plates (MCP) are currently available: the 25mm and 18mm ones. 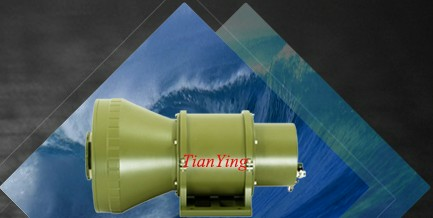 From the users prospective the larger diameter is more efficient but also requires larger NV unit. In this category, manufactures a multifunctional NV Scope — series of rifle scopes . All of the above mentioned units are equipped with an additional manual brightness control that allows the viewer to adjust the scope for the optimal gain/noise ratio. With a light gain of 25 000–35 000 the Gen II+ tubes have photo cathode sensitivity of 300–450+ mA/lm and are sensitive to light in the infrared spectrum. Resolution is 32–45 lp/mm. Work capasity of the tube is estimated to be 1 000–3 000 hours (Typical MTTF 2000 hours ),typical SNR 13 . Since the Gen. II+ tubes are smaller (they do not have a speed up chamber) they have a slightly lower light amplification than the Gen. II. Yet due to the especially high sensitivity in the IR spectrum the Gen. II+ units have better viewing distance in the open space. If the main task for the unit is photo or video recording, the Gen II NV unit should be chosen due to its higher light gain. NV units with the Gen. II+ tubes are equipped with automatic gain control, flash protection, protection from the side light distortions and feature a high quality image throughout the entire field of view. Units equipped with Gen. II+ tubes are used by the armed forces of many countries and considered to be of professional quality by the experts. DEP produces a range of in-house developed compact Image Intensifiers for use in Night Vision applications. This product line runs from standard Image Intensifiers to SHD-3™ and XD-4™ up to the top quality of XR5™ Image Intensifiers. All these tube types are available both in 18 mm inverting and non-inverting format and for SMALL as well as FAT ANVIS configurations. Further, they can also be coupled via tapered fibre-optics to a number of commercially available CCD’s for Intensified CCD (ICCD) cameras. DEP Image Intensifiers perform extremely well in every environment and under all circumstances. With its wide spectral range and specific design, they are ideal for use under dynamic light conditions and in green environments, deserts, coastal areas and on water and snow. 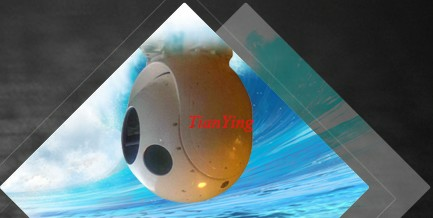 DEP makes the difference and is your best choice, if you go for high performance and high quality. 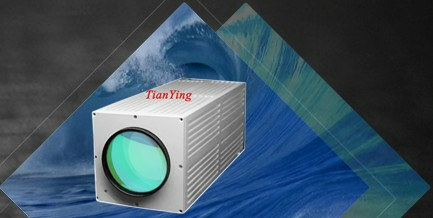 Image Intensifier performance is mainly determined by three major parameters: Signal-to-Noise Ratio, Resolution and MTF. Night Vision Imaging at low light-levels is a fight against noise and the determining factor with respect to picture quality is the Signalto-Noise Ratio of the tube. In the High Light-Level Range the Resolution and MTF determine the image quality. Especially the MTF at low spatial frequencies is very important for the sharpness and contrast of the image. The SHD-3™ type of Image Intensifier is an upgrade of the well-known DEP Super Generation tube. 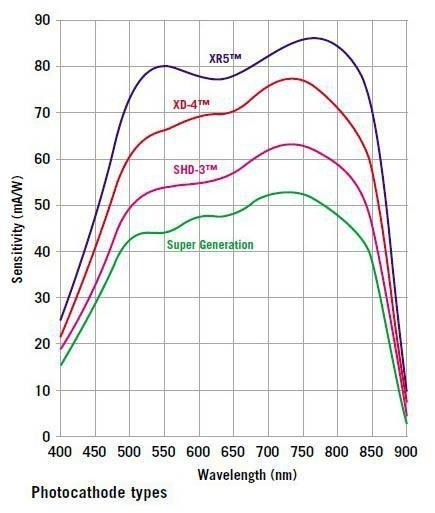 The SHD-3™ technology combines the very good sensitivity of the Super Generation Image Intensifier with superior resolution and MTF (see table on the next page below). These improvements produce a much higher contrast in the image. Like for the XD-4™ tube, other strong points of the SHD-3™ Image Intensifier are that it is sensitive in a wide spectral band thus providing good contrast in all scene circumstances and that no burning occurs until quite bright light levels are experienced. The SHD-3™ Image Intensifier is characterised by a guaranteed Signal-to-Noise Ratio (SNR) of 18 at 108 μlx and a guaranteed limiting resolution of 45 lp/mm. Of course also here it applies that the SHD-3™ tube can be supplied in almost every mechanical construction which makes it compatible with both old and new night vision devices.. Resolution from 45lp/mm to 54lp/mm. Signal-to-Noise Ratio(SNR) min 18,typical 21+. 10000 hours tube life . The XD-4™ is the top grade of the DEP Image Intensifiers. With the introduction of the XD-4™ technology a new European Standard for low light imaging was born providing an unprecedented performance in Night Vision applications. The XD-4™ Image Intensifiers perform extremely well in all environmental conditions. Its wide spectral sensitivity range makes that a perfect picture is obtained no matter in which area the user is (foliage, on water, snow, desert, rocky and barren land) and what the light conditions are (down to heavily overcast starlight). The XD-4™ Image Intensifiers provide as well a superb image under very dynamic light conditions. The base for the unique performance of the XD-4™ is the used technology by DEP. This has resulted in greatly improved performance parameters that are crucial for good observation, such as the Signal-to-Noise Ratio (SNR), the Modulation Transfer Function (MTF) and Resolution under all circumstances. Add to this the very long lifetime throughout its complete luminance dynamic range and you will be convinced of its unique performance. 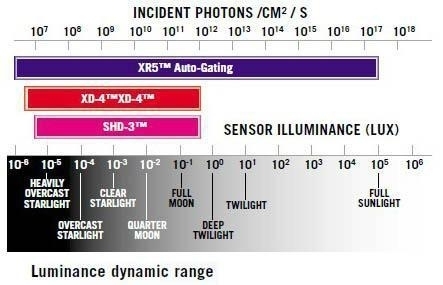 The performance parameters of the XD-4™ Image Intensifier are listed in the table below. Highlights of the XD-4™ specification are the typical SNR of 24, the resolution of 64 lp/mm and over and - very important - the high MTF at low and intermediate spatial frequencies. The latter gives the image its sharpness and contrast. It goes without saying that the XD-4™ tubes can be supplied in every common mechanical construction including inverting and non-inverting fibre-optic output, which also means that users have the opportunity to upgrade the performance of existing Night Vision Equipment via a drop-in XD-4™ Image Intensifier. Resolution from 55lp/mm to 64lp/mm. Signal-to-Noise Ratio(SNR) min 20,typical 23+. As a result of sustained and continuing product development, DEP is introduce the latest, innovative XR5™ Image Intensifier with unprecedented performance for any environment and any circumstance. The XR5™ Image Intensifier, successor to the well-known and successful XD-4™ Image Intensifier, reveals even more details of the night and offers an eXtended Range (XR) capability thanks to its new technology. Furthermore, the XR5™ Image Intensifier enables the user to see even more during a full 24-hour day/night operation. This is done by the use of a fully integrated Auto-Gating unit, which controls the image not only during day-night-day transitions but also during dynamic lighting conditions such as those experienced, for example, in night operations in urban areas. In practice, this means no blooming to hinder your mission but dependable imagery throughout. In addition, the halo is the smallest on the market. The XR5™ Image Intensifier from DEP represents the new European standard for Night Vision and is available in a variety of inverting and non-inverting 18 mm formats. The new XR5™ is your best choice to maintain your combat effectiveness under all circumstances. Resolution from 64lp/mm to 70lp/mm. Signal-to-Noise Ratio(SNR) min 25,typical 28+. 15000 hours tube life . 4th generation / Gated Filmless technology represents the biggest technological breakthrough in image intensification of the past 10 years. By removing the ion barrier film and "Gating" the system Gen 4 demonstrates substantial increases in target detection range and resolution, particularly at extremely low light levels. Up to 100% improvement in photoresponse. With significant improvement in contrast level and in performance under all light conditions, 4th generation represents the top of the line performance in the night vision market. Note: The term 4th generation is used/accepted among Night Vision manufactures to describe gated filmless tubes. However, this designation is widely debated and is currently referred to as Filmless & Gated image intensifiers by the US Military. Gen 4 technology improves night operational effectiveness for military users of night vision goggles and other night vision devices. The filmless MCP provides a higher signal-to-noise ratio than Gen 3, resulting in better image quality (less scintillation) under low-light conditions. The gated power supply further improves image resolution under high light conditions, and the reduced halo minimizes interference from bright light sources. These improvements also substantially increase the detection range of the systems. Optical part of a night vision device consists of an objective and an ocular. The main demand on the objective is a high light transmittance in visible and near IR diapason. It is expressed with geometric light power from the line (F-number) 1; 1,4; 2,0; 2,8; 4,0 and so on. The objective with increased number (in a step) makes light transmission twice less. High light power is very important for night vision devices especially for devices Gen. I, I+. By light power degradation till 2,4–2,8 a naked eye can see better than with night vision devices Gen I in passive regime. 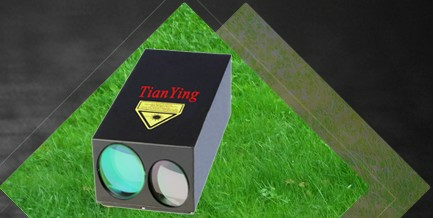 Elaboration and producing of high light power optic with focal ratio less than 1,5 is a difficult task. Not every manufacturer is able to produce it. 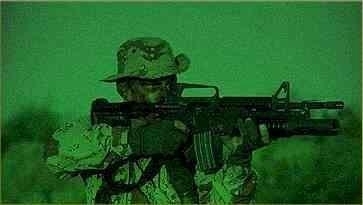 Of course cost of light power optic of high quality has an influence on the final cost of night vision devices. A lot of manufacturers equip their night vision devices with objectives of larger focus distance and low light power to get a bigger magnification (3,5–5,0). If you prefer to choose between two devices (of the same Generation and dimension but with greater magnification) the distance and the image you get is going to be worser than in items with lesser magnification and greater light power. 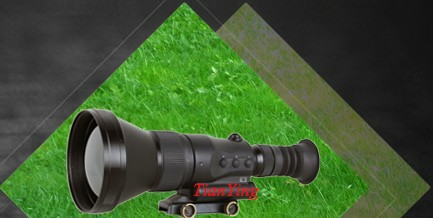 It is very important especially for night vision riflescopes for hunting. All devices series are completed with objectives of a lightweight design and good light power F/1.2 or F/1.5. Sometimes night vision devices are completed with mirror lens objectives. They guarantee smaller overall pivotal dimension but have a decamouflage effect and have by the same conditions the worse light power. That is why they refuse to produce night vision devices with mirror lens objectives in Russia and abroad. When an Image Intensifier is used in really dark conditions the quality of the picture on the phosphor screen drops dramatically. Its overall brightness level falls and individual scintillations, tiny flashes of light, become more clearly visible. Such a picture is said to have become 'noisy' and we describe this situation as being 'information-limited'. The only way to improve any image that shows signs of information-limiting is to increase the number of photons used to create it. A few of the basic problems of seeing at very low light levels are so fundamental to the physical state of darkness that they can only ever be overcome by the use of active illumination, be it visible or covert. All generations of Image Intensifiers need light to work - they cannot provide a useful image in complete darkness. They are, however, sensitive to infrared light. At night, some 70% of light is in the infrared spectrum. The introduction of semicovert/ covert illumination overcomes this problem and users should consider having some sort of IR illuminator available to assist the Intensifier when climatic or lighting conditions restrict its performance. Semi-covert/covert illumination can be produced in three ways. Infrared lamps offer the greatest range and they are more eye safe, although they are bulky and can consume a lot of power. Laser illuminators are not eye safe - they stay cool and use very little power, but are generally expensive. The only illuminators that are truly discreet and safe use LED's. Unfortunately, with many of these the useful range is restricted to 30 metres, although there are exceptions. Only SuperGen/HyperGen or Gen 3 systems are sensitive enough to be used with truly covert (900+ nm) IR illuminators. Due to the tube sensitivity, IR illuminators produced for Gen 1/Super Gen 1+ and standard Gen 2 systems produce a dull red glow from the LED and are described as semi-covert. The use of IR illuminators is the most cost effective way of getting big increases in Intensifier performance. The downside would be if someone else was using a night scope - they would potentially see your IR illuminator very clearly. Evaluation factors that impact the actual cost of acquiring a night vision capability are image tube life (referred to as "reliability"), warranty coverage, repair availability, service support, and overall workmanship as an indicator of quality. When evaluating night vision equipment, the initial acquisition cost does not equate to the cost of ownership. How often will you need a new image tube? What is the likelihood for repairs? Are batteries available? What about exposure to bright lights? All image intensifiers will "wear out" over time due to gases generated within the tube that migrate to the photocathode and slowly kill it. Because of this, characteristics such as reliability, a bright-source protection (BSP) circuit, and the presence or absence of an ion-barrier film on the microchannel plate are important. mil specs describe procedures for projecting reliability. You should know what the reliability is for the tube you evaluate. An important factor that can influence reliability is the voltage used to produce gain. If an image tube is "driven" hard to produce high gain, it will accelerate the production of gases and more quickly kill the ability to convert light into electrons. A final evaluation criteria is to determine whether or not the night vision device incorporates automatic protection for the image intensifier when it is exposed to high-light conditions or bright-light sources. Image tubes manufactured by Tiangying have a BSP circuit built into the image intensifier. This circuit automatically reduces the voltage to the photocathode when the system is exposed to bright light sources. The BSP feature protects the image tube and enhances its life. If there is doubt, consult the warranty; does it exclude exposure to high light or bright lights? Some night vision advertising has presented confusing information listing Russian equipment as Gen I, Gen II, and Gen III, when in fact, by worldwide classification it is Gen 0, Gen I, and Gen II, respectively. While the prices of "reconditioned" Gen II systems may be attractive, be aware that the hours of remaining life and photosensitivity performance cannot be restored to Gen II tubes. "Reconditioned" usually means the system has a new or repaired power supply but the photosensitivity will be lower, the SNR will be lower, and the remaining life will be less. Some reconditioned units may be operating at below acceptable minimums and few companies possess the necessary test equipment to evaluate the tube's level of performance. The military specifications for Gen II require a reliability of 2,000 hours of operating time (Tiangying's new Gen II image intensifier has tested to well beyond the military specification). This situation does not pertain to Gen III equipment. Due to the presence of an ion-barrier film in Gen III devices, the gallium-arsenide photocathode is protected from degradation and the life and performance are extended many times longer than Gen II. The physical characteristics of NV units are usually designed with three factors in mind, compactness, weight and observation distance. Unfortunately sometimes these characteristics are in conflict with one another. For example, greater observation distances can be provided by a unit with a larger lens with the inherent disadvantage that the device will be bigger in size and weight. The customer has to decide which characteristic is a priority and buy accordingly. One factor, which is especially important, is the construction of NV rifle scope — it must be extremely rugged to withstand the shock of up to 500 Gs along the optical axis due to recoil. In this harsh environment the cross hairs, sighting posts and targeting adjustments must remain unmoved and be visible in all types of viewing conditions. Many NV rifles copes currently offered on the market are not designed to compensate for these stresses (cal. .365H&H, .416Rirby) and may have weak mounting and zeroing-in systems. This will require repeated readjustments to maintain accuracy. This is a complicated subject that cannot be discussed properly in a short article. We encourage you to contact our company for a special consultation on the subject. As you look through a night vision device you may notice black spots on the screen. A NVD is similar to a television screen and attracts dust and dirt. Typically these spots can be cleaned. However, this may also be a spot in the tube itself. This is normal. Most tubes will have some spots in them. These black spots will not affect the performance or reliability of the night vision device. The buyer should take into account that the distance of observation and identification, which night vision devices provide, depends on the level of night illumination, clarity of atmosphere and contrast between an object of observation and background. When illumination increases the distance of identification becomes higher. When illumination reduces it becomes lower. The table of average distance of night observation and identification of an object is given below (based on the domestic and foreign data).